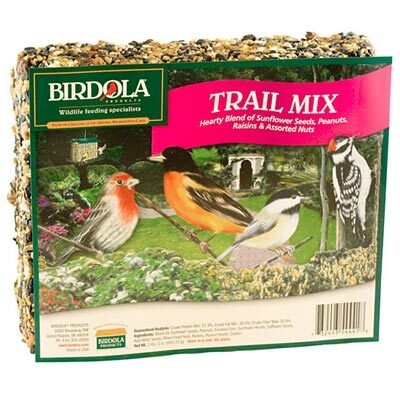 The Birdola Trail Mix Cake provides your wild birds with a tasty high energy feeding option. A great alternative to loose seed feeding, seed cakes can attract a variety of wild birds or just a few species, depending on the type of seed cake you use. This hearty cake contains a blend of nuts, seeds, and dried fruits to treat a variety of wild birds with important nutrients. The Birdola Trail Mix Cake is a sizable snack for high metabolism birds. Made in the USA.